1- Quinton Coples, DE, North Carolina: Coples was dominant at times this week and looked unblockable in 1 on 1 drills versus almost everyone on the South offensive line. He can be as good as he wants to be thanks to his great combination of size, length and athleticism. He projects to be a great LE in the NFL if he continues to work and provide the effort level that he had this week. 2- Courtney Upshaw, DE/OLB, Alabama: Upshaw has convinced me that he can play 4-3 DE or 3-4 OLB. I think he might be a better 3-4 outside linebacker, but he’s got plenty of upside. He might not have ideal measurable and 40 yard dash times, but he is a very strong, powerful player that is fundamentally sound. I wouldn’t bet against Upshaw in the NFL, and I don’t think you should either. 3- Melvin Ingram, DE/OLB, South Carolina: Ingram definitely impressed me this week. I think he can play in both a 4-3 and a 3-4 as well, and should be fine at outside linebacker where I think he might have the most upside. He has an impressive variety of pass rush moves and was all effort this week, taking reps standing up, with his hand in the dirt at DE and even inside at defensive tackle at times in 1 on 1’s. 4- Shea McClellin, DE/OLB, Boise State: McClellin feels like he should be higher on this list, but the three guys ahead of him are potential 1st rounders much like McClellin might end up being. He’s an impressive kid with better speed and pass rushing ability than a lot of people give him credit for. He’s a top 60 pick for sure, may be a top 40 guy when all is said and done. 5- Vinny Curry, DE, Marshall: Curry definitely has upside, and should get a 2nd or 3rd round grade from me after I finish my tape study of him, but he didn’t beat Mike Adams all week and didn’t look overly impressive rushing the passer this week. Once he was engaged he struggled to rush the passer, and while he has size and athletic ability he needs some development. 1- Mike Martin, DT, Michigan: Martin really impressed me this week. He’s not tall, but he’s very well built and is extremely strong, plus he has natural leverage because of his lack of ideal height. He’s got a terrific motor and very active hands, and just doesn’t stay blocked. He’s going to go higher than a lot of people expect him to. 2- Brandon Thompson, DT, Clemson: Thompson definitely showed his athleticism this week when he beat people off the ball initially with his burst and hand usage. He’s a 2nd round pick in my opinion but he’s got plenty of upside as a 3-tech, and he reminds me a bit of Jonathan Babineaux from the Atlanta Falcons. 3- Kendall Reyes, DT, Connecticut: Reyes weighed in lighter than I was hoping him to, but he’s got plenty of burst and athleticism off the snap. He’s got upside as a pass rusher, and might be able to contribute in a rotation early on in his career in pass rushing situations, but I worry about him versus the run. He can penetrate and get into the backfield, but I think he might get washed out in the run game if he doesn’t get stronger and put on a little weight. 4- Derek Wolfe, DT, Cincinnati: Wolfe came into the week very underrated but he had a strong week all week, showing his versatility to play defensive end or defensive tackle. He projects very well to a 5 technique or to a 3 technique at the next level in my opinion. His versatility will definitely help him on draft day, and he really opened some eyes this week if they hadn’t watched him play much. He may end up with a 3rd or 4th round grade from me once all is said and done. I think he has a future as a NFL starter without a doubt. 5- Jaye Howard, DT, Florida: Howard is someone I’ve been a fan of since early on in his junior season when I was watching tape of Florida. He’s got NFL size and athleticism, and I think he may end up in the fourth round when all is said and done. He’s not rated high but he’s got the ability to contribute to a NFL rotation early on in his career. 1- Keenan Robinson, OLB, Texas: Robinson is my favorite linebacker here and it was really fun to be able to interview him yesterday. He’s a complete linebacker than can play all three positions if needed, but projects best to the weak-side. He’s strong, can attack blocks, is a very good tackler who has pop as a hitter, shows ability in coverage and can blitz when asked to. He’s got it all, and he’s very underrated despite that. I may end up putting a 2nd round grade on him when my film study on him is done. 2- Zach Brown, OLB, North Carolina: Brown had a great week, partially because the practices were non-contact and he wasn’t able to display his relatively poor tackling skills. This week was the perfect venue for Brown to show off his terrific athleticism and his ability to run around and find the ball. However, when he’s got the pads on and is asked to tackle he will come back down to Earth because he’s not a fundamentally sound tackler and often tries to go for the big hit. He also likes to arm tackle, and doesn’t consistently wrap up at all. I expect two or more missed tackles from him today. 3- Lavonte David, OLB, Nebraska: David is an undersized linebacker who will probably have to play weak-side linebacker in the NFL, but he’s a very good tackler who is a pretty complete linebacker himself. If he was a little bit bigger he would be a very highly thought of prospect, and I have always been one who doesn’t like to overlook smaller players with lots of talent. 4- Sean Spence, OLB, Miami: Spence is another undersized playmaker at linebacker. He’s even smaller than David is unfortunately, and at the beginning of the week there was talk of moving him to safety, but I think he has to stay at linebacker personally. He’s got good instincts, is a reliable tackler and shows some ability in coverage. Play him at weak-side linebacker and he should be fine. 5- James-Michael Johnson, ILB, Nevada: JMJ is one of the more athletic middle linebacker prospects in the draft this year. Like Brown, the practices this week were a chance for him to put on a show thanks to his athletic ability. I’m much more interested to see how he tackles today. 1- Janoris Jenkins, CB, North Alabama: Jenkins looked like a 1st round pick the entire week. He’s an impressive athlete with the ability to play press-man, off-man or zone coverage in my opinion. Some were not high on him coming into the week, but I knew I was watching a special corner when I saw him at Florida. He’s got off-field concerns that will hurt his stock, but I still see him ending up in round 1. I feel more comfortable with him on the field than I do with Dre Kirkpatrick. 2- Brandon Boykin, CB, Georgia: Boykin is an undersized corner but he presents plenty of upside as a starter at corner as well as a return man. He won a college football award for versatility this year, and I think he may end up in the 2nd or 3rd round range once all is said and done. 3- Casey Hayward, CB, Vanderbilt: Hayward has been underrated for the last two years but he’s finally starting to catch some people’s eyes. He told me he thought part of that was that not a lot of people watch Vanderbilt, which I definitely think has some merit. But he put his skills on display this week and I think he’s a top 100 player without a doubt. 4- Jamell Fleming, CB, Oklahoma: Fleming is a guy that not a lot of people have been high on, but I like his upside as a man or zone coverage corner. He’s a quality cover man, and I think he has starter potential in the NFL. 5- Leonard Johnson, CB, Iowa State: Leonard Johnson came into the week with a little hype and I think he lived up to it. He’s not a very good off-man corner, though he does have the ability to mirror receivers which impressed me, but his value comes as a press-man corner or perhaps in zone. I think he’s a top 100 player as well. 6- Ryan Steed, CB, Furman: Steed isn’t a big corner but he has pretty good change of direction ability which he showed this week. He looked better in press-man than off-man, but struggled a bit when asked to locate the ball and make a play on it at times. I haven’t seen much tape on him, but I think he has upside and would like to see more of him if I get the chance. 1- George Iloka, S, Boise State: Iloka is one of the more physically impressive players here thanks to his impressive size, length and athletic ability. He didn’t impress me in man coverage this week, but he’s got pretty good range and his size will help him deep against big, physically imposing receivers at the next level. 2- Markelle Martin, S, Oklahoma State: Martin didn’t stick out to me a lot this week, but he’s always looked reliable on film and in a weak safety class he may go earlier than he should. I’m interested to see how he does when he’s asked to play deep in pretty vanilla coverages today. 3- Brandon Taylor, S, LSU: Taylor was a playmaker at safety this year for LSU but I didn’t quite see the playmaking ability here this week. He’s definitely a draftable prospect in the 4th round range, but I’m not sure how much upside he has. 4- Antonio Allen, S, South Carolina: Allen is a player that has a good feel for finding the ball and seems to be a pretty reliable tackler. I’m not sure how he is in coverage though, so I’m looking forward to seeing him more today. 5- Harrison Smith, S, Notre Dame: Smith has had a solid week but he hasn’t been great. He’s not a flashy player and seems like a pretty reliable guy, but I’m not sure he has starter upside at the next level. 1- Randy Bullock, K, Texas A&M: Bullock was the Lou Groza award winner this year and he was a great kid to talk to when I had the chance. He’s got a strong leg and he’s obviously very accurate, so I’ll be rooting for him in the NFL. He may even have a chance to get drafted, which isn’t a given for kickers. 2- Drew Butler, P, Georgia: Butler has a very strong leg, I noticed it last year when I was scouting Justin Houston. He can really punt that ball a long way, and has a shot at getting drafted even though he had a pretty inconsistent year kicking for Georgia when I watched him. 3- Brad Nortman, P, Wisconsin: Nortman is a very good punter with a strong leg as well. He, Butler and Anger from the Shrine Game all showed draftable ability to me which is pretty rare for punters. 1. DaJohn Harris, DT, Southern Cal: DaJohn Harris was a guy that I thought was very underrated all season long and I think he opened some eyes this week. He doesn’t have elite size, strength or speed but he is well rounded and consistent. He needs to play lower at times but he can rush the passer and stop the run from the 3 tech position which is where I think he has the most NFL upside. He should be able to contribute to a rotation early in his career and could go in the 4th round range. 2. Akiem Hicks, DT, Regina Canada: Hicks may not have played like the 2nd best defensive linemen every day but I don’t think there is any question he has the upside to be one of the best players that was in St. Petersburg this week. He has all the size, power, athleticism and length that you could want in a defensive tackle and he flashed a lot of potential this week. It wasn’t always consistent, and he needs significant work on playing with leverage and he needs to develop much better technique and hand usage, but there is a lot of raw potential there. If he lands on a team with a good defensive line coach and they are patient with him he could end up being something special. 3. Dominique Hamilton, DT, Missouri: Hamilton was a late round pick before this week but I think he has piqued some interest through his play this week. He has great size and strength for the position and has flashed some burst off the line of scrimmage to penetrate into offensive backfields. He doesn’t offer a lot as a pass rusher at this point and will stand up out of his stance too often which limits his ability to move offensive linemen. He knows that he needs to work on that though and he has been improving in that aspect since the end of his senior season. 4. Tyrone Crawford, DE, Boise State: Crawford was a guy that was not very well known coming into the week but he definitely impressed me when I watched him. I questioned his ability to shed blocks coming into the week but he definitely showed the ability to do that this week and also showed up bigger and stronger than I expected. I’m not sure he’s a great fit for the 4-3 defensive end position, but I think he may even be able to slide inside to the 3 tech position or continue to bulk up and play the 3-4 defensive end position. His versatility will definitely help him. 5. Justin Francis, DE, Rutgers: Francis definitely looked like one of the better pass rushers at the defensive end spot this week and on top of that he had an absolute non-stop motor all week. He seemed to be the emotional leader of the West defensive line and the guys I talked to from that group mentioned him as a guy with a terrific motor. He will make hustle plays that’s for sure, I just wonder how much upside he has beyond being a rotational defensive end in the NFL. 6. Travian Robertson, DT, South Carolina: Robertson may not be a great pass rusher at this point but he definitely showed the ability to play strong at the point of attack and wasn’t easy to move off the ball for anyone on the East offensive line this week. He offers value as a run stopper and warrants a late round draftable grade in my opinion. 7. Nick Jean-Baptiste, DT, Baylor: Jean-Baptiste (or NJB as I like to all him) definitely showed his potential as a pass rusher this week as I compared him to BJ Raji after watching him in pass rush drills on Monday and Tuesday. He was dominating and he was virtually unblockable 1 on 1. The trouble came in team drills when he faced regular double teams and didn’t look great against the run (which was an issue when Baylor played Washington in the Alamo Bowl as well). He plays a little high at times despite his natural leverage because of his height, but he just isn’t as consistent of a run defender as you would like to see. He has upside and he definitely warrants a draftable grade, I’m just wondering if he will ever be more than a rotational guy. 8. Kyle Wilber, DE, Wake Forest: Wilber definitely flashed his potential as a pass rusher this week but he is too light and lean to stay at 4-3 defensive end in the NFL. He will have to transition to outside linebacker in a 3-4 defense in my opinion, and while he has the ability to at least be a reserve and a special teamer there I just don’t know if he has the athleticism to drop into coverage. He’s tall and pretty lanky so he isn’t exactly built for coverage, but I’ve never seen him drop into coverage before so he is a bit of an unknown in that respect. I still think he is draftable though and he showed some of his ability this week and may cause some trouble for the lackluster group of tackles on the West squad. 9. Micanor Regis, DT, Miami: Regis looked quite good in 1 on 1 drills this week when he was rushing the passer and definitely showed throughout the week that he has a good first step, good burst off the line of scrimmage and he has a pass rush move or two that he can use off the ball to beat you right off the snap. He wasn’t as good once he was engaged though and he struggled versus the run this week. He can definitely contribute to a rotation as a pass rusher inside, but defending the run is something he will have to try to work on in the NFL. That makes me wonder if he will get drafted or just signed as an undrafted free agent to let him earn his way onto the roster or practice squad. 10. Matt Conrath, DE, Virginia: Conrath is one player that I would like to rank higher but based on the week I can’t right now. He was playing out of position this week though and isn’t built for the 4-3 defensive end position in the NFL. I don’t think he’s a good fit inside at defensive tackle either thanks to his 6’7”, 282 pound frame. I think he is definitely a 3-4 defensive end and he really didn’t get to show that this week. He’s someone that I think will go in the later portion of the draft but he takes coaching so well and has a perfect frame for that position that I think he will end up contributing to a roster and potentially ending up as a solid starter in a couple years. 1. Brandon Lindsey, OLB, Pittsburgh: Lindsey was playing out of position this week as a 4-3 OLB but hopefully he won’t be drafted to play in that scheme. His best fit in the NFL is as a 3-4 OLB. It would have been nice if he had shown the versatility to drop into coverage as a 4-3 OLB this week, but he looked best when he was doing simple drops, particularly in the flat. He didn’t look great in deeper drops and he made his plays on the ball on his shorter drops. He has potential as a pass rusher and should be able to drop into coverage as a 3-4 OLB well enough to eventually be a starter. 2. Josh Kaddu, OLB, Oregon: Kaddu consistently impressed me with his athleticism this week and should continue to do that in today’s game. He is the best 4-3 OLB here this week and he showed that every day in practice. I never got to see him in full pads though so I am interested to see how he runs with them on and I want to see him tackle more importantly. 3. Jerry Franklin, ILB, Arkansas: Franklin is a player that I think is a bit underrated and while he may not be a stud linebacker I definitely think he is a draftable prospect that will provide value as a special teamer and a reserve before potentially being a starter. He won’t start today’s game but he will definitely get playing time. It will be interesting to see the dichotomy between Franklin and Tank Carder at inside linebacker today for the West. 4. Shawn Loiseau, ILB, Merrimack: Loiseau isn’t a guy that makes you say “wow” with his size or athletic ability but he definitely leaves you saying that thanks to his passion for the game and his leadership capability. Whether this kid is drafted or not I would be shocked if he didn’t make a NFL roster because he is willing to do whatever the coaches ask him to and he strikes me as a potential special teams ace. I’m not sure if he has starter upside, but he will definitely be on a NFL roster one way or another. 5. Brandon Marshall, OLB, Nevada: Marshall is the “lesser” of the two senior Nevada linebackers but I think he might be a more fundamentally sound football player than his teammate James-Michael Johnson who will play in the Senior Bowl next week. I really want to see him tackle though and I haven’t seen him in full pads all week, but he has flashed ability in the run game and in pass coverage. 6. Tank Carder, ILB, TCU: Carder made plays in pass coverage consistently this week as we all expected but I haven’t seen an ounce of physicality from him in the trenches and I don’t think he can shed blocks from offensive linemen up at the line of scrimmage. I really want to see him in full pads when he has to fill versus the run because I think that is a serious weakness in his game. I don’t think he has starter potential in the NFL and I think he will end up being a WLB in a 4-3 when all is said and done. 7. Ronnie Thornton, ILB, Southern Mississippi: Thornton isn’t the best linebacker on either Shrine Game roster but he always looked like a good tackler to me on tape and I am excited to see how he does with full pads on today. He will be a reserve and a special teamer at the next level, but I think he can make a roster doing those things. 1. Josh Norman, CB, Coastal Carolina: Norman definitely had the best week of any defensive back as he regularly made plays on the ball either by intercepting them or deflecting them during all four days of practice. I like his ball skills, his size, his great closing burst and his willingness to hit people. He couldn’t lay anyone out this week, but there were two or three times that I can remember he really looked like he wanted to. I’m excited to see how he supports versus the run and how he tackles today. 2. Shaun Prater, CB, Iowa: Prater didn’t have a great season this year but he had a good week of practice this week. He doesn’t have great hands but he has pretty good ball skills, fluid hips and a nice, low back-pedal. He looks like he can be a quality nickel back in the NFL and perhaps even a #2 starter at some point. 3. Micah Pellerin, CB, Hampton: Pellerin was the second best defensive back all week for the East but he doesn’t strike me as a physical player and I really want to see how he supports the run and how he tackles. He is athletic though and showed some ball skills and closing speed this week, but I’m not sold on him having starter upside. 4. Robert Blanton, CB, Notre Dame: Blanton didn’t have a great week when he was dropping into zone coverage and he didn’t always look good in man coverage (particularly against quicker receivers) but he showed his potential as a press man corner one day this week. He looks huge for a cornerback and it’s hard to believe he is only 6’0” tall, but he warrants a draftable grade in my opinion. 5. Duke Ihenacho, SS, San Jose State: I liked Ihenacho coming into the week and I still do but he had his issues in coverage at times this week and didn’t look very fast either. He’s a good tackler though and should be comfortable supporting the run in this game. He’s definitely draftable in my opinion, but I just wonder if he has a future as a NFL starter. 6. Aaron Henry, S, Wisconsin: Henry is someone that plenty of people like but I can’t say I’m as big of a fan. He allowed a lot of big plays this year for Wisconsin and I think that is a problem that will not be easily fixed once he gets to the NFL. He’s got the athleticism and some ball skills but I just don’t think he has starter upside at safety. I could be wrong, but I just haven’t seen it and I have watched a lot of Wisconsin football the past two years. 7. Jerrell Young, S, South Florida: Young didn’t impress me early in the week but he looked better throughout the week to me. I’m not sure where his draft stock is at this point, but I think he is draftable and warrants consideration later in the draft. 8. Keith Tandy, CB, West Virginia: Tandy is someone I was not impressed with this week. He looks tight in the hips and is a little tall in his back-pedal, and I don’t think he has much upside outside of being a zone corner where he can close on things in front of him. He struggled in man coverage this week in my opinion and I think he’s a 4th or 5th round pick right now, maybe even a little later. 9. Rodney McLeod, CB, Virginia: McLeod was a bit of a pleasant surprise in my opinion because he showed fluid hips, good footwork and nice low back-pedal consistently this week. I’m not sure if that transitioned onto the field that well but it was definitely there in drills. He has spent time at safety but I think he has a chance to stick as a corner in the NFL. 10. Blake Gideon, S, Texas: Gideon had some of the same issues that Henry did this week as he let guys get behind him deep at times and he was scolded for it by his coaches when it did. He’s a solid player though and I think he warrants some late round consideration, but if he doesn’t get drafted I think he will be able to make a roster as an undrafted free agent. Bryan Anger, P, California: Anger looked great punting the ball all week whether it was with the wind or into it. He timed well on his hang time and the scouts I was sitting with pointed out regularly the sound that the ball makes when it comes off of his foot. He surprised me with his leg from day one at the West practices and he kept it up all week. He may even be draftable as a punter which isn’t exactly common, but he will definitely get a chance as an undrafted free agent if he doesn’t get drafted. He has a NFL leg. Defensive MVP Prediction: Nick Jean-Baptiste, DT, Baylor: I like defensive linemen in these games but the interior defensive linemen on the East will have a tough challenge going up against Brandon Brooks, the talented guard on the West roster. NJB has flashed potential this week though and I think he is a bit of a sleeper for this award. He can penetrate and get upfield and he has looked good in 1 on 1 situations this week. He could end up with a tackle for loss or two and a sack today. B.J. Coleman (Chattanooga) remains the top QB in St. Petersburg this week, though he isn’t perfect. His footwork is still developing but he has thrown the ball pretty well all week. He has had accuracy issues, I don’t see a lot of anticipation throws from him, and there are a few balls every day that wobble a bit off of his hand. He has upside and I think he could end up in round 4. Austin Davis (Southern Mississippi) had an up and down day today. He threw a couple interceptions today and doesn’t always look comfortable in the face of pressure (which has forced some mistakes from him). He threw the ball better when he had a clean pocket though, but he just doesn’t have the arm to stretch the field sideline to sideline. I still think he can stick on a roster, but he is a fringe draft prospect. Tauren Poole (Tennessee) continued to look like the best back in St. Petersburg again today. He was complimented by the coaches a few times today, showed impressive burst, vision and lateral agility. I can’t wait to see how he runs through contact on Saturday. Alfred Morris (Florida Atlantic) showed some burst as well, continued to catch the ball well out of the backfield, and looks thick. It will be interesting to see how he runs through contact on Saturday. Tim Benford (Tennessee Tech) continued his strong week catching the ball well, creating separation as a route runner, and proving to be a reliable receiver. He had a couple nice routes that created separation downfield but quarterbacks didn’t see him open. He should get drafted. One guy I have been critical of all week, LaRon Byrd (Miami) looked like a different receiver today. He ran better routes and I don’t think I saw him drop a pass all practice. He looks vastly better than he did on Monday, so take that for what it’s worth. Kevin Hardy (Citadel) continues to be inconsistent catching the ball, and was working with coaches on his route running from what I could see. His coach told him a couple times that the game would be won with his head, not with his speed. Again, take that for what it’s worth. Chase Ford (Miami) continued to catch the ball well today, but I don’t think he offers much as a blocker. He’s got impressive size and length for a tight end along with some athleticism, so he has range as a receiver. His hands are solid and he has definitely helped himself this week, but I don’t think he has a ton of upside. Evan Rodriguez (Temple) looked solid today as he has all week and made a couple nice catches. He’s not a flashy guy, but he’s reliable. Emil Igwenagu (Massachusetts) has gotten an invite to the Senior Bowl which surprised me, but I have a feeling it will be as a fullback, not as a tight end. He missed a couple blocks the last couple days when I was watching him though, so we will see how he does. Bradley Sowell (Mississippi) has impressive size but he has short arms (32 ½ inches) and while he has a solid first step and can create a bit of push off the line of scrimmage he leans quite a bit and hasn’t looked good in 1 on 1’s this week. He looks like an undrafted free agent at this point. Lamar Holmes (Southern Mississippi) also looks like an undrafted free agent this point, and didn’t get a lot of positive comments from the coaches this week. At 6’5”, 320 pounds with 35 ¼ inch arms he has the size and arm length to project to tackle, but the ability just hasn’t been there. Rishaw Johnson (Cal PA) continues to look powerful with his initial punch and he showed some ability to sustain today. He had a few good match-ups with Akiem Hicks today in team drills and he won them for the most part when I was watching. He’s definitely got starter potential, but like I have said before he has character issues that have to be looked into before teams will be comfortable taking him in the 4th or 5th round range. I’m not sure if I have this 100% right, but it sounded like the offensive line coach was talking to Quentin Saulsberry (Mississippi State) when he said “I hope you’re ready to play the whole game” during practice today. Not exactly a positive comment for Tyler Horn of Miami, but it definitely reaffirms Saulsberry’s solid week of practice if I am correct. Again, take it for what it’s worth because I can’t be sure. Matt Conrath (Virginia) had a good day of practice today. He got his hands up into passing lanes consistently today (and may have been doing this all week) and batted at least two passes down today. One of them was batted up into the air and he came down with it for an interception. He doesn’t have much burst off the line or enough edge speed to play 4-3 DE in the NFL, but I think he looks like a great prospect to play at 3-4 DE. He seems to take coaching well as he has improved as the week has gone on and at 6’7”, 281 pounds he definitely has the size and solid length (33 3/8 inch arms) to project to that position. He won’t go early, but he seems like a guy who could go in the later portion of the draft in the 5th or 6th round, stick on a roster, and continue to work and improve over the next couple years until he ends up being a significant contributor on the defensive line for a 3-4 team. Kyle Wilber (Wake Forest) has had a good week this week. He isn’t a top guy obviously, but I think he has a chance to stick as a 3-4 OLB in the NFL. He’s lean and needs to add weight, but he has some edge speed and burst. He doesn’t have much in the way of pass rush moves and he doesn’t have the natural power from his lower body to bull rush yet, but I think he has some upside. Shawn Losieu (Merrimack) looked pretty good today. He’s not a freak athlete and he likely doesn’t have starter upside, but I like his intangibles and leadership capability and he flows to the ball well. He even showed the ability to stack and shed at the line of scrimmage today which was good to see. I’m not sure he will get drafted, but I would wager that he will make a roster. Brandon Lindsey (Pittsburgh) had an interception in coverage today and while he doesn’t look fluid in coverage and doesn’t always get great depth in his drops he should be alright as a 3-4 OLB when he is asked to drop into coverage. For those of you who don’t remember, Justin Houston came out of Georgia last year and I didn’t think there was any way he could play 3-4 OLB because of his struggles in coverage. He had 46 solo tackles and 5.5 sacks this year. So even if Lindsey struggles some in coverage, don’t assume he won’t be able to survive in a 3-4 scheme. Finally, Max Gruder (Pittsburgh) continues to show quality instincts but his athleticism limits his range sideline to sideline and he doesn’t have great speed. Josh Norman (Coastal Carolina) continues to be the star here and he looked pretty good today. I don’t think he had any interceptions that I know of (therefore marking the first day of practice this week that he hasn’t had one) but he looked good in coverage and may just have played his way into the top-100 of this upcoming draft. Jerrell Young (South Florida) looked solid in coverage today even though he got burned a time or two early this week in 1 on 1’s. I’m interested to see how he looks in coverage on Saturday as he will likely be over the top. But he looked comfortable in zone today. I’m not sure how good R.J. Blanton (Notre Dame) is in zone coverage, but he looks very big for a corner. I will be interested to see how he does in man coverage and in zone on Saturday, but he looked most comfortable in press-man coverage this week. Manuel has a quality combination of size, arm strength and athleticism. It will be interesting to see how he progresses as a senior. EJ Manuel, QB, Florida State: Manuel was a junior this year and with plenty of starting experience under his belt I expect him to have a good year for FSU next year. Don’t forget that while this was his first full season as a starter he filled in for Christian Ponder the previous year when he was hurt. Manuel has a strong arm and can make all the throws but struggled with accuracy in this game. I attribute to some of his errant throws to playing behind an offensive line starting an unbelievable four freshman up front due to injuries. Zebrie Sanders, a potential 1st round offensive tackle prospect, was the only usual starter on the offensive line and even he had slide from right tackle over to the left side. However, Manuel made a few poor decisions in this game and could have easily had one or perhaps two interceptions in this game. He displayed some quality accuracy when he wasn’t pressured but the repeated pressure and some hits affected him in my opinion. He’s clearly an athletic specimen due to his size and ability to pick up yardage with his legs and he flashed some ability to stand tall in the pocket to deliver passes downfield. It will be integral for him to consistently do this next year versus making one read and scrambling like many quarterbacks with the ability to scramble tend to do. He is losing a few starters on offense, but I believe they are replaceable. If he can clean up some of his decision making, improve his pocket poise a bit and clean up some of his footwork he could really improve his draft stock. Teams will be immediately intrigued by his combination of size, arm strength and athleticism especially after the season Cam Newton has had this year. Manuel’s challenge will be convincing that while he isn’t the rare player Newton is that he has significant upside. More importantly, he needs to show tendencies and attributes that would indicate that he will achieve it. Newton is one of the rare quarterbacks who didn’t display some of the things he has done this year in college but has managed to do them in the NFL, but he is the exception that proves the rule in this instance. I don’t know much about Manuel’s work ethic or film study habits, but I look forward to evaluating him next year. He has upside, but upside is nothing without the work ethic, desire and intangibles to achieve it. Bert Reid, WR, Florida State: I am personally not a big fan of Bert Reed. He flashed some potential when I was scouting Christian Ponder last year but he didn’t impress me much this year. He has pretty average size, isn’t a burner downfield and I’m not sold on his hands at this point in the draft process. It will be interesting to see if he gets an invite to an All-Star game because I would love an extra look at him in person. He had a nice touchdown catch in this game but it was made possible by a perfect throw by Manuel. Reid hadn’t created much separation and while I haven’t watched him enough to know if that is a regular occurrence it warrants mentioning. If he does struggle to create separation the ability to make catches in traffic will be important, so showing that he could do that on that touchdown catch is at least a small flash of ability in that respect. As I said earlier I am not high on Reid right now and have a 6th/7th round grade on him right now, but we will see what I think of him once I do more film study. Rashad Green has great upside and I was really impressed with his performance in the 2nd half. He's only a freshman, so keep an eye on him. Rashad Greene, WR, Florida State: Let me just say that I love this kid and I’ve only seen him play in two games this year. That isn’t to see that I haven’t seen Florida State at all this year, but it is my understanding that he really came on strong late in the year. He didn’t have a significant impact in the 1st half but he made two huge catches in the 2nd half as well as a touchdown reception to help propel FSU to the comeback win. While I would have liked to see him make more plays in the 1st half and I did see him drop a pass on a 1st down throw from Manuel I really loved the fact that he showed up in the 2nd half when his team needed it the most. If you read my stuff regularly you know that I really place a premium on players that make plays when their team needs them the most and I truly believe that is a quality that is cultivated in some people while others just aren’t born with it. 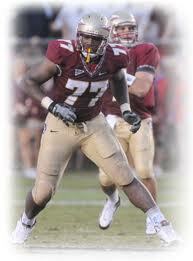 I think Greene has that quality and that will be important when I evaluate his NFL draft prospects in a couple years. I’m very excited about his potential and upside because he is only a freshman and played an integral role in this 2nd half comeback win for the Seminoles. Keep an eye on this kid! He’s got a very bright future. Rodney Smith, WR, Florida State: Rodney Smith has all the height you could ask for in a receiver at 6’6” but he seems to have a skinny frame and looks EXTREMELY skinny on film. He should be able to add weight pretty easily, but I’m not sure he will ever be a 6’6”, 225 pound receiver because his frame just doesn’t seem conducive to trying to bulk up. Regardless, he flashed impressive hands in this game and caught a pretty tough pass on a throw that was behind him after he made his break and seemed to do it pretty effortlessly. He’s another returning player on FSU’s offense and while he wasn’t a starter this year I do think he’s going to make a significant contribution next year. His size and hands will be valuable all over the field but particularly in the red zone. Kenny Shaw, WR, Florida State: Shaw had a solid game and I think he is a solid player overall. I don’t think he has the upside of a player like Greene or Smith but he can contribute. He made all of his catches in the 1st half while Greene saved his heroics for the 2nd half. It may seem unfair to claim that Greene’s receptions were worth more than Shaw’s, and perhaps it is especially because he was making a play here and there when Florida State was struggling to move the ball. However, Shaw seemed to be body catching and while he was creating separation against Notre Dame’s secondary I didn’t think he looked like a burner. Of the three returning receivers I have mentioned in this post I think Shaw’s ceiling is the lowest, but I don’t think his floor is more appealing than that of Greene’s. Obviously I haven’t seen them play enough to be absolute in this claim, but that is my perception having seen a couple of their games before I delve into more intense film study after the East-West Shrine Game and the Senior Bowl. Zebrie Sanders got his shot at left tackle this year and it has really improved his stock. Zebrie Sanders, OT, Florida State: I am high on Zebrie Sanders. I’ve had a late 1st round/early 2nd round grade on him for a long while and I truly believe he has a chance to go in the 1st round. I’m really hoping he will be at the Senior Bowl because I would love to see him play against that caliber of competition for a week, but I would also love to interview him. I don’t want to pat myself on the back, but last year I identified him as a player that I thought could slide over from the right tackle spot and stick at left tackle in the NFL even though it seemed unlikely that he would ever get the chance to prove me right as a junior or as a senior with Andrew Datko starting there and doing a pretty good job. However, when Datko got hurt this year Sanders got that chance and I think he played quite well especially considering a mid-season change in assignment. He’s an athletic guy with impressive size, long arms, a good-looking kick slide and seems to be a natural knee bender. He demonstrated the ability to do some hand fighting while continuing to sustain a block in pass protection and once he gets his hands on you he does a good job of taking you out of the play consistently. He also showed pretty consistent hand placement and showed the ability to stay in front of his man on a spin move. He could stand to add weight to his frame particularly in his lower body to help him anchor versus bull rushes, but that is something that can be coached and improved upon with training and weight lifting. You can’t coach his size, arm length and athleticism and that is why I think he will ultimately end up in the 1st round. Brandon Jenkins, DE, Florida State: Jenkins is a bit of a frustrating prospect for me because I feel the exact same way about him now as I did last year. His athleticism, burst and edge speed is all extremely intriguing and that makes you drool as a talent evaluator, especially when the premium has never been higher on players that can rush the passer. However, he is just not strong enough to be a true terror as a pass rusher yet. He has flashed some hand usage this year which is good because last year he relied almost exclusively on his athleticism to beat offensive tackles. But because of his lack of size, strength and hand usage he can be engulfed and taken out of plays at times which is a little frustrating to watch when so many people expected him to develop into a sure fire 1st rounder that would leave early. He got a bit of a free sack when he was running a twist with DT #93 in this game and as he beat the guard inside (again, with only his athleticism) Rees lost his balance, fell down and Jenkins was credited with a sack that looks a lot better on the stat sheet than it does on film. The story continues to be the same for Jenkins: He’s got all the athleticism you could want in a pass rushing prospect but he has to get stronger and continue to refine his technique if he is going to become a true force as a pass rusher. The potential is there, it’s just a question of how much of it will be realized at this point. Bjoern Werner, DE, Florida State: Werner is a guy that I had to mention not because I think he is going to be a sure-fire first round pick in 2013 but because I think it’s awesome that he is from Germany. I kind of found myself hoping that he would do something recklessly awesome in this game (though I have no idea what that would have entailed) but all he did was demonstrate that while he doesn’t have a lot of edge speed he does have some burst off the line of scrimmage, a little bit of bend and hip flexibility and a pretty awesome name. I don’t think he is much more than a mid-late round guy at this point, but he was pretty productive this year and should only improve next year so I thought he warranted mentioning. Cornellius Carradine, DE, Florida State: Carradine isn’t a guy that I saw a whole lot in this game but he showed up with a sack or two in this game (even if one of them was when he came free off the edge) so I thought he warranted some investigation. I don’t know a whole lot about him and he didn’t stick out to me much when I saw Florida State play earlier this season, but I think he has some upside and obviously still has time left to develop. I haven’t seen him nearly enough to put a possible grade range on him yet, but I wanted to make note of him as a guy that I have on my watch list for the future. Anthony McCloud, DT, Florida State: McCloud is a guy that I expected a bit more from in this game as he seemed to be getting pushed off the ball more than I expected, particularly in the 3rd quarter. He had a couple nice stops at the line of scrimmage in this game but I was expecting to see him anchor better at the point of attack and occupy blockers better when he wasn’t trying to get into the backfield. I’ll keep an eye on him next year though. Nigel Bradham isn't a top linebacker prospect but he is fundamentally sound. I think he will be a reliable starter in the NFL. Nigel Bradham, OLB, Florida State: I like Bradham. I don’t have him as a 1st or 2nd round pick, but I do like him as a 3rd/4th round guy. He seems to be a good tackler, he’s reliable in coverage, has good range sideline to sideline and I think he could be a reliable starter in the NFL. He seems like a guy that it would be a mistake to bet against because he’s while he doesn’t have elite size or freakish athleticism he is fundamentally sound and seems to have a good work ethic. A couple things stuck out to me beyond him being a good tackler in this game. One of them was the fact that while he was still a reliable tackler he flashed some serious pop as a hitter. One prime example of this was when Michael Floyd was making his circus catch in the end zone Bradham found his way over to him and just after Floyd managed to haul the pass in Bradham LEVELED him and left him grimacing in pain after somehow holding on for the touchdown reception. He had another impressive hit or two in this game, one that warranted me writing in my notes that “Bradham made a fantastic hit. You could just hear it.” The second thing was that while I didn’t notice this often I did notice that late in the game Bradham was on kick-off coverage on FSU’s special teams unit. As a senior starting his final game for the program I loved to see that. Not only that, but he made a special teams tackle inside the 20 yard line! So, needless to say I like Bradham and I think he will be a quality 4-3 WLB starter for somebody looking for a reliable starter. Christian Jones, LB, Florida State: I didn’t watch him much in this game but he was getting some rave reviews from some of the people that I follow on Twitter. From what I can gather he is a pretty impressive athlete (some labeled him a freak athlete) and he seems to have a lot of upside from the little that I did see of him in this game. There was one play I noticed where he looked like he was covering a slot receiver for Notre Dame and doing a shockingly good job of it for a linebacker at his size. I’ll definitely have to keep an eye on him next year because he seems like a pretty good candidate for my potential break-out players list assuming he hasn’t already done so and I just wasn’t aware of it. Greg Reid, CB, Florida State: Greg Reid is a very undersized corner but I have been pretty impressed with him ever since I saw him for the first time as a freshman against Miami. He’s only about 5’8” but he is a very impressive athlete. He is very fast, quick and has unbelievable leaping ability. This was evidenced very clearly when Tommy Rees threw a fade to Michael Floyd in the end zone and despite being about seven inches shorter than Floyd Reid was able to elevate and get his hands to a nearly identical height as Floyd’s. Floyd ultimately came down with the touchdown after bobbling it for what felt like an eternity, but Reid had already shown what scouts will love and hate in one play. They will love his athleticism, his ball skills and his instincts to time his leaps appropriately to make a play on the ball. However, his natural lack of height will seriously limit his upside in the NFL as he just won’t be able to match up in man to man coverage with big, physical receivers that are even bigger and more physical than Floyd. I like his potential as a nickel corner and think that if he proves he has enough ability in coverage he could take a Brent Grimes path to a starting job. Grimes is very fundamentally sound and has fantastic athleticism and ball skills which help make up for his lack of size. Reid can take a similar path if he has the dedication and work ethic that Grimes does, but I have not yet evaluated how well he supports the run and how good he is in man coverage. He’s got everything you could want in a zone corner thanks to his athleticism, speed and burst but I haven’t watched him in man coverage in a long time. I like his upside and I think he could be a #2 in the NFL if everything falls right for him, but more than likely he will spend some time as a nickel corner before he gets his shot to start. Luckily for him he has a lot of potential as a returner and should be able to contribute in that phase of the game immediately in the NFL. Special teams is a great way for players to stick on a roster and I wouldn’t be surprised if Reid uses that to boost his stock in the draft and to make sure he sticks on a roster when he ultimately leaves Florida State. Lamarcus Joyner, S, Florida State: Joyner is another undersized but very athletically gifted defensive back on Florida State’s roster. Joyner had one of the more electrifying plays of the game breaking off a big return to set up Florida State with great field position for that drive. He’s very fast and while I didn’t get to see him much on defense I did see him deliver a huge hit on Floyd on the sideline on a play that ultimately injured both Floyd and his teammate Xavier Rhodes. Joyner laid a pretty big hit on Floyd’s midsection not long after he had taken a shot in a similar area from Nigel Bradham so it was understandable why he was hurt (though he did get up and walk away while Rhodes was still laying on the ground). Joyner is only a sophomore so he has plenty of time left to develop, but he will need to show me more in coverage beyond just being a very fast safety if I’m going to buy into his upside. Dustin Hopkins, K, Florida State: Yes, every once in a while I have to include a kicker on my prospect lists. This is one of those times because Hopkins is an impressive kicker. He has a very strong leg and made two critical field goals in this game. Evaluating kickers is almost as much of a crapshoot as evaluating quarterbacks as far as I’m concerned and I haven’t quite figured out what kickers can do in college to prepare them for successful NFL careers. I think there may be some correlation between exposure to high pressure situations in college and success in the pros, but even that isn’t a fool-proof quality. Regardless, I like Hopkins’ NFL chances as of now. Not only did he make two critical field goals in this game that could have been the difference in the game he also wears gold shoes that he repaints before every game. If that’s not swagger I don’t know what is, so I say do your thing Dustin Hopkins! Do your thing until the NFL fines you for your fancy gold shoes! Tommy Rees, QB, Notre Dame: I know Rees hasn’t had an altogether terrible season this year, but the only note I wrote down for him in this game was one word: “Garbage.” It’s harsh, but I think it’s pretty accurate. He doesn’t have a strong arm, he’s not consistently accurate, he panics under pressure, he makes poor decisions especially when pressured, he’s not overly athletic and he is just very average or below average as a quarterback. Notre Dame really needs to get their quarterback situation straightened out and I don’t think Tommy Rees is the answer. Maybe I’m being way too harsh early on in his career, but I wouldn’t want him starting for me if I was coaching Notre Dame or any other Division 1 program. Obviously, considering all I have just said, I don’t think he has a NFL future. Cierre Wood, RB, Notre Dame: I think Wood has some potential as a late round 3rd down back, but his lack of versatility is going to hurt him in my opinion. I think Notre Dame really needed a physical back in this game and it was pretty clear that Wood does not fit that bill. I’m not sure he has great balance but he definitely doesn’t run through many arm tackles or gain a lot of yards after contact. He does have some speed and he can catch the ball out of the backfield, but I don’t think he has a lot of upside. Floyd has a lot of upside but I have some concerns about his toughness. I don't have a top 10 grade on him. Michael Floyd, WR, Notre Dame: Michael Floyd is probably going to end up being a 1st round pick but I don’t think I could draft him in the first round if I was running a team. There are just too many things that concern me about him. First, I know it’s beating a dead horse but his off-field issues at Notre Dame have to give you some pause. I know he earned his way back onto Notre Dame’s football team, and I commend him for that, but that DUI is definitely concerning. As far as on-field concerns, I worry a bit about his straight line speed as well as his burst to create separation in the NFL. He struggled to create separation against a pretty talented corner in Xavier Rhodes and I think that will end up hurting his stock. The last thing scouts got to see of his Notre Dame career wasn’t him tearing Miami up like it would have been if he had declared last season, it was him having a solid but not spectacular game largely in part because the corner who seemed to have his number went down with an injury. On top of that, he wasn’t on the field in crunch time when his team still had a shot to win the game late, which brings me to my next concern: I question Floyd’s toughness and resolve. Maybe this is unfair since I don’t know him personally and have never talked to him before, and I certainly wasn’t standing next to the Notre Dame athletic trainer when he was examining Floyd on the sideline, so take this for what it’s worth. I think Floyd should have been in the game, no question, no doubt in my mind. I’m not a fantastic athlete, but the competitor inside of me always wanted to be in the game late when my team needed me and I can’t understand how anyone would feel otherwise ESPECIALLY if you are as good and important to your team as Floyd is. Now, I will retract this statement if it turns out that Floyd cracked a rib or had some serious injury which he certainly could have had considering the big hits he took to the mid-section in this game. However, he was standing on the sideline with his helmet on if I remember correctly. That means the trainer didn’t take his helmet and bar him from going in, and in my opinion that means he made the call to not come back in. Do you think those hits would have kept Tim Tebow out of a game? Do you think they would have kept Brett Favre out of a game? They might have kept Randy Moss out, but plenty of people considered Moss a selfish diva. Why isn’t Floyd viewed the same way? I was told two years ago that he was a diva and I took it under consideration but I hadn’t seen a lot to suggest that it was true or false. Two years later, particularly after this display, I believe that it was the truth. I apologize for this rant, but I value intangible qualities heavily into my assessments when I can judge them to the best of my ability and I don’t like Floyd’s intangibles at all. Don’t get me wrong, it’s not like he became a potential 1st round pick by accident. He’s got NFL size, some NFL speed, NFL athleticism and pretty close to NFL hands. I say pretty close because he will make some fantastic catches but he also has a tendency to drop a pass or two every once in a while that he really should catch. He reminds me a little bit of Julio Jones in that aspect, and while you might say that Julio Jones is having a great season all things considered I would say that he has had some drops this year that I don’t think a guy like A.J. Green would have dropped. Floyd has similar issues to Jones in that respect, but he isn’t the freak athlete Jones is. So while some will tout Floyd as a top 10 pick I will personally stay away and depending on my film study I may not even grade him as a first rounder. I’ll be in the minority, and I might get proven wrong, but I really think that Floyd’s intangibles have to play in to anyone’s evaluation of him and I just don’t think he has enough ability to outweigh those concerns and still get a 1st round grade right now. Theo Riddick, WR, Notre Dame: Riddick is another converted wide receiver for Notre Dame. The last time they did that it worked out really well for them as Golden Tate formed a pretty dynamic duo with Michael Floyd when he was here. Riddick isn’t the same athlete that Tate was, but I like running backs that convert to wide receiver because they tend to be more physical after that catch. 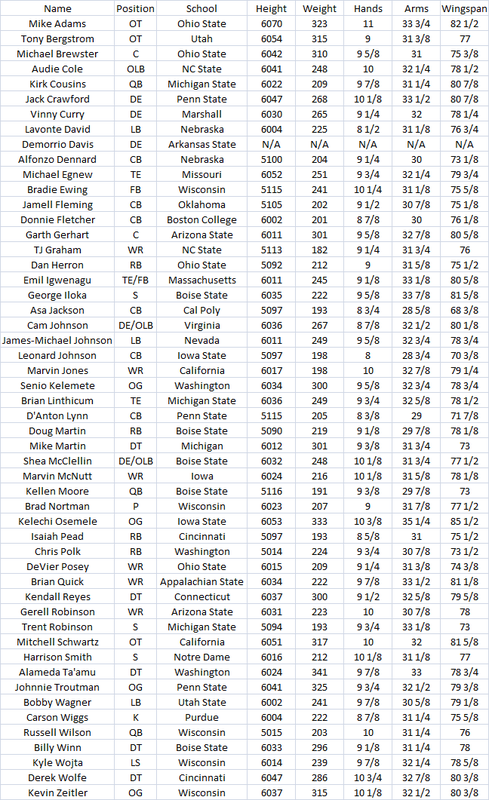 I haven’t evaluated Riddick much yet, but he is definitely on my radar which is why I wanted to put him on this list. Tyler Eifert has amazing upside and I think he reminds me of Rob Gronkowski to be honest. Tyler Eifert, TE, Notre Dame: Eifert is considering coming out this season and with good reason. Is he ready to get drafted by a NFL team and start from day one? Perhaps not. However, I do think he has as much upside as any draft eligible tight end and that includes Dwayne Allen and a player I have been touting for at least a year in Orson Charles. Eifert has a combination of size, athleticism and great hands that led me to compare him to Rob Gronkowski after watching him this year and in the bowl game against FSU. In my opinion he was Notre Dame’s true go-to receiver this year as he made a lot of key catches for them late in games that I saw. He’s not a very effective blocker yet but he has shown a willingness to block and with coaching he could definitely be a quality in-line blocker. Like so many tight ends these days he can split out as a receiver either in the slot or on the outside and attack defenses. He’s got terrific range due to his athleticism, his huge frame, long arms and great hands. I think he is a better prospect than Kyle Rudolph who many people were touting as a possible first rounder despite his injury. He’s got Jimmy Graham/Rob Gronkowski upside and people are starting to see that, so if he does declare and ultimately get selected outside of the 1st round then whoever gets him is going to get a STEAL much like the Patriots did with Gronkowski and like the Saints did with Jimmy Graham. You heard it here first. Zack Martin, OT, Notre Dame: Martin has LT potential thanks to his combination of size (6’4”, 303 pounds) and athleticism. He did a pretty good job against Brandon Jenkins in this game though he did give up some pressure. He seems to move laterally pretty well and I think he has some potential to stick at LT in the NFL, though I could see him moving inside to guard due to his size and ability to pull in the run game. He doesn’t have elite tackle size and may only be 6’3” when officially measured. He’s got upside though and I will definitely be keeping an eye on him next year. Aaron Lynch has insane upside. I'm really excited to see him develop at Notre Dame. Aaron Lynch, DE, Notre Dame: Lynch is only a freshman but he has beast written ALL over him. He’s got a terrific combination of size, athleticism, strength and motor. He is going to be all over NFL draft boards in a year or two and with good reason. He’s an absolute animal at defensive end and has top 10 upside in my opinion. Keep an eye out for this kid, this is only the beginning of a great college career for him. Louis Nix III, DT, Notre Dame: Nix III is another defensive lineman I like on Notre Dame. He’s got terrific size for a defensive tackle and has the athleticism to penetrate and make plays in the backfield. One thing I saw him flash was a quality motor to chase plays down from the backside which was very encouraging. Finding defensive tackles with great motors is pretty rare, so if he truly does have a good motor it will only help his draft prospects. I didn’t get to see how he held up to double teams in this game but there will be plenty of time to look at that in the future because he is so young. With Lynch and Nix on their defensive line Notre Dame has the makings of a pretty dominant defensive line in a year or two. Manti Te’o, ILB, Notre Dame: Te’o has announced that he will return to school for his senior year which I can respect, but now writing a scouting report on him is a much lower priority as a result. Regardless, I think he has 1st round potential for next season but because he has chosen to come back for a year he is opening himself up to what will inevitably become nit-picking criticism of his game. It happens to most players that come back for their senior seasons after they showed enough potential to consider declaring early after their junior seasons and go in the 1st or 2nd round, so it is fairly likely that it will happen to Te’o. Personally I like Te’o. I think he could play middle linebacker in either a 4-3 or a 3-4, but I particularly like his upside as a 3-4 inside linebacker. I’m not sure dropping into coverage is a strength of his, but he is a very good tackler, he packs a lot of punch as a hitter and he does a great job timing his blitzes and putting pressure on the quarterback. For that reason I think that he could have more upside in a 3-4 defense because, at least on the surface, the scheme seems to play to his strengths a bit more than a base 4-3 defense would. I think Te’o would have had a great shot at the 1st round this year, but as a college student myself I can’t fault him on going back for another year of it. He’ll never get a chance at it again, so I can’t fault him for taking advantage of that while he can.